The word Chitral can mean many things. It’s a ferocious river, a charming city, and until 1969 a centuries old kingdom nestled around the Hindu Kush Mountains. The kingdom was formally integrated into Pakistan as a district of then North West Frontier Province (NWFP) now Khyber Pakhtunkhwa KP. As such the king, known as the mehtar, was no longer the administrative head. However, the institution continued to be revered by locals and the royal ‘Kator’ family remained prominent. Their decedents went on to become decorated military officers, government ministers, Polo captains, and foreign diplomats. On the cover is an unassuming man clad in quintessential outdoor-wear holding a freshly caught Golden Mahseer. But the book itself is anything but typical. Firstly it’s as much about fishing as it is about travel. Each chapter is dedicated to a particular angling location from Uzbekistan to Thailand and as far as Bhutan. It is well printed on heavy paper common in coffee-table books. Every other page has a colorful photograph, not only of various kinds of fish but of Nepalese elephants, wild bores, Bhutanese gaurs and even crocodiles. The photos also include vibrant local fruits and spectacular landscapes and even one of Mount Everest. The writing is intimate and personal. The author opens up about all the stresses in his life that he escapes through fishing. The reader also gets a behind-the-scenes view of politics and intrigue in the royal Katore house. We see Fateh-Ul-Mulk struggle with the idea of joining mainstream politics or keep a safe distance so as to not taint the Mehtar institution. We see his efforts usurped by rival relatives and at one point he is even tops the Taliban’s hit list. The geopolitical undercurrents of the book are a special treat for the reader. The author is a keen historian as well. Throughout his travels he narrates the respective histories of the places and people he encounters. From a Buddhist Chakma Raja of Bangladesh to a Sri Lankan Monastery that once was a brothel. The pages are full of fantastic tidbits of South East Asian history. The author makes it a point to argue the commonalities of Asians and records many incidents to that end; for example the linguistic similarities between his native tongue of Khowar and the Uzbek language. A particular heart warming example comes after an unsuccessful day on a humid lake in the Thailand where a visibly sunburnt Fateh-Ul-Mulk and a fellow Christian fisherman pray for better luck at a nearby Hindu temple. The author also undertakes what can only be described as a country-to-country scholarly study of the variance in tastes of his favourite drink –Fanta. Hint: It’s scrumptiously sour in Uzbekistan and extra sweet in Thailand. Ultimately the book is about fishing. The fishing jargon is mostly in layman terms so the reader can easily keep up and even learn a few things such as the importance of sun block and which bait suits which fish. The book chronicles some spectacular catches and one even sets a world record. More than anything the reader is sure to absorb the author’s passion for fishing and his love of South East Asia. Adventuring around the region is an activity that brings him great joy and tranquillity. The summary of the book is that fishing is just a cover for good food and loving friends surrounded by magnificent scenery and lots of campfires. Its stories will surely bring out the outdoorsman in any reader. 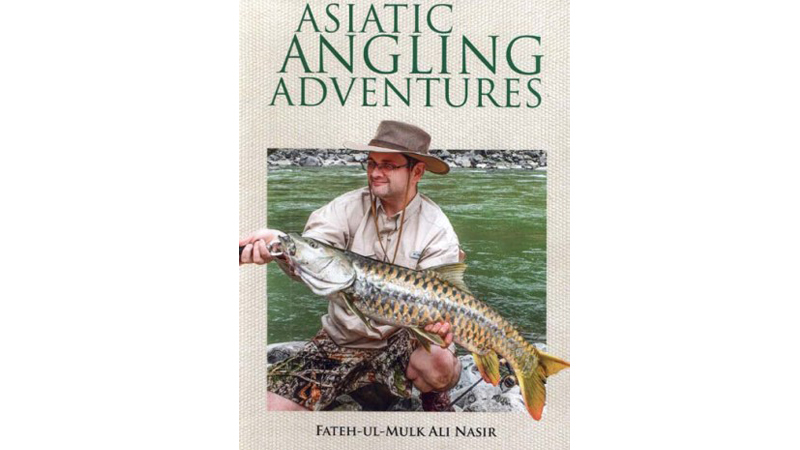 Asiatic Angling Adventures is available in Hardcover at Saeed Book Bank in Islamabad. In Lahore it can be purchased directly from the publisher, La’Topical.